There is ... a diagram of the early village, unique and useful. The original was drawn by Juba Storrs, and marked "Plat of Buffalo village as it is at this date, April, 1813." What has become of the original is not known. Some fifty years ago it was in existence, and a lithograph reproduction was made. From one of the copies of that reproduction our sketches are drawn They are an exact copy of the original except for the correction of a few errors, the division of the plat into two, to fit our pages, and a general re-lettering, to make it more readily understood. The diagrams show the inner lots which had been built on, in the spring of 1813. The unnamed buildings are barns, shops and sheds What is now Exchange, from Main street east, is really the starting-point of settlement. Note has been made of the location of Middaugh & Lane's cabin. The houses of Judge Barker, and of Root, in the Storrs drawing, were its successors. John Crow's log tavern stood in 1803 near the southwest corner of present Exchange and Washington streets. When Capt. Samuel Pratt brought his family here in 1804 he first lodged at Crow's, then in a temporary log house on the Terrace, then in his own house on the present site of the Mansion House [1842 illustration on p. 60; 1859 illustration on p. 61], west of Crow's [illustration on p. 346]. His first store was on the north side of Crow street -- now Exchange -- but he soon built a two-and-a-half story frame house on the corner, with store adjoining, as shown in Storrs' plan. 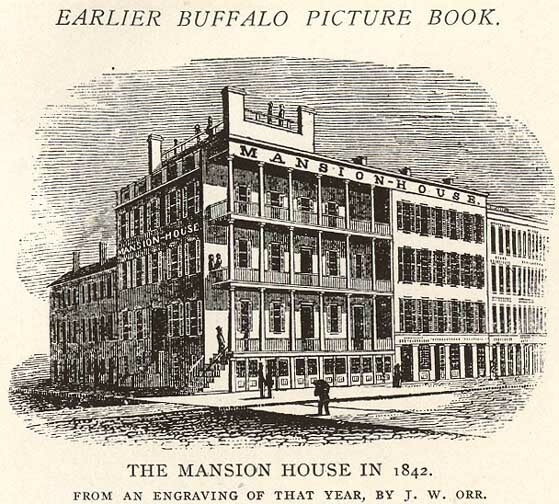 This was the first frame dwelling in Buffalo and was called the Mansion, which probably indicates the source of the name of the Mansion House. In 1809 Crow's became Landon's, which name it bore in 1813 when the town was burned. Rebuilt after the war, it was kept until 1824 by Joseph Landon, and is described as a "long low wooden building, south side of Crow between Main and Washington." In 1825 it was kept by Phineas Barton, who named it the Mansion House, which name it still bears. Philip Dorsheimer conducted it for some years and made it famous. Opposite this property, in 1813, was Louis Le Couteulx's house and garden; and to the east of them, the house of Juba Storrs, who drew this diagram. Passing up what is now Washington street, there were three houses, all on the east side: that of Despar or Despard, a baker; then the house of David Rees, his blacksmith shop opposite, on the northeast corner of Washington and Seneca. A little further up was Campbell, a barber. Passing up Main street, above Le Couteulx's, we come to McEwen's house and shoe-shop; then the market of Vincent Grant, where the Birge building (People's Bank) now is. Pomeroy's tavern was on the northeast corner of Main and Seneca. Then came the custom house, and the stores or houses of Stocking & Bull, Grosvenor, and Daley. The west side of Main, beginning at the Terrace, showed Joshua Gillet's market, then the U. S. Indian Agency, in the charge of Erastus Granger; the property of Isaac Davis; Cook, a tavern keeper; Grosvenor's house; and Townsend & Coit's drug-store at Main and Swan, where the Townsend block now stands. Dr. Chapin was across Swan street (the Chapin block now stands on the Pearl-street end of the block), and just above him, fronting the common (Erie street) was the store of Eli Hart. The Ellicott reserve, on this map, east of Main, extends from Swan to Eagle streets. Ebenezer Walden's house was at Main and Eagle. In the rear, east of Washington, was the house of Kane, a mason, and the old stone jail. In the block above, west of the Washington-street line, was the first court house. Above Eagle the street lines have been changed. Present Court street and Broadway are not shown. Samuel Pratt, Jr., built at the northwest corner of Main and Eagle streets, in 1810. A few other houses were scattered along the west side of Main street (that side preferred by the early settlers because less exposed to the lake winds): Haddock, a cabinet maker; Juba Storrs; St. John, Hopkins and Stocking. Those further up the street were pretty well out of the clearing. With one or two exceptions, there was nothing west of Pearl street except forest. The first school house was at Pearl and Erie -- present Dun building -- the county clerk's office was a little below, and the pioneer printing office of Smith H. Salisbury, at the northwest corner of Pearl and Seneca streets. Rees' blacksmith shop, the stone walls of the jail, and the St. John house were all that were not destroyed when the village was burned, eight months after Juba Storrs made his sketch. Of the buildings that were burned, many were of logs, a few were frame, and a few were brick. The store of Juba Storrs & Co., on Main near present Court street, is said to have been the first brick building in Buffalo. The second was Judge Walden's house, built in 1811, at the northeast corner of Main and Eagle. This house is shown in a lithograph of the Tippecanoe log-cabin, on a subsequent page.